Last September the South End welcomed Anoush’ella; a family owned and operated Eastern Mediterranean restaurant that serves Armenian and Lebanese cuisine. 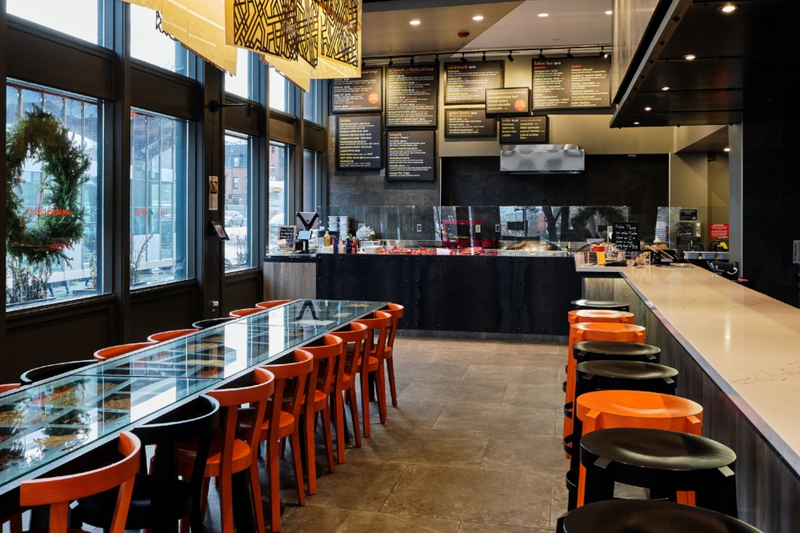 The casual dining restaurant is a welcome change to the $30+ a plate restaurants that dominate the South End and as you can see from above the space is well designed and very comfortable. Most of the menu focuses on flatbreads, wraps and bowls, which you order at the counter (everyone is very patient and is happy to explain the menu). Once you’ve ordered find a seat at the bar, communal table or individual tables in the back. While the restaurant is very popular for lunch and dinner and has a brisk take out business, I have have started visiting Anoush’ella for breakfast on Saturday mornings. With the average price point for breakfast, lunch and dinner ~$15, you can afford to visit repeatedly if you like. 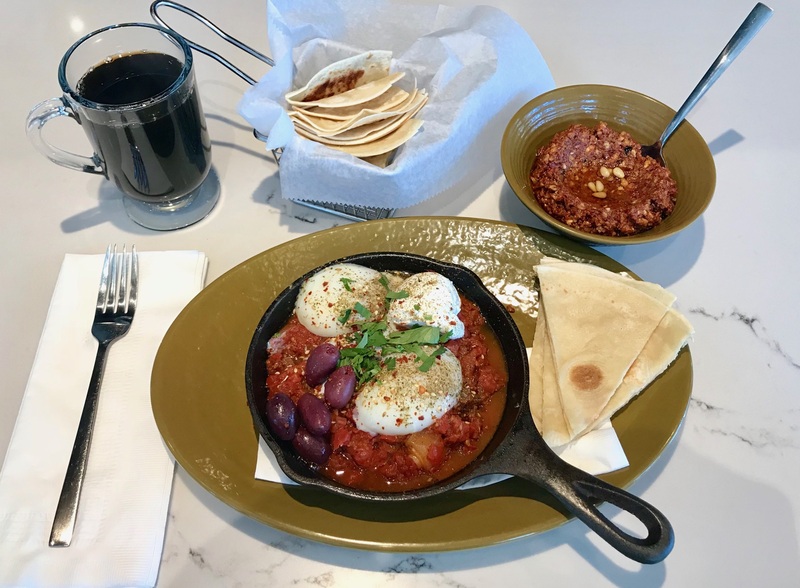 Above is what has become my “go to” breakfast: Shakshuka which is diced tomatoes, onion, olives and red pepper with za’atar (a blend of oregano, basil & thyme), cumin, coriander, paprika, garlic cloves, topped with cilantro, two poached eggs and labne (Greek yogurt). I also get a side of the Walnut Harrissa which is made with red peppers and adds a bit of heat. The pita bread is made fresh to order, and I use it to scoop the food. They also have sweeter options for those who may prefer something a tad less savory including: Nutella chocolate with strawberry, banana, cinnamon, honey and granola as well as some more traditional Armenian options like Kenefe, which is made with crushed filo dough and cheese wrapped with sesame seeds and served with orange blossom syrup. Anoush’ella is open seven days a week. Monday through Friday 11AM – 9:30PM and Saturday and Sunday 10AM – 9:30PM and serves beer and wine. BosGuy Rating: 4 out of 5 stars, Awesome. This entry was posted in Restaurant Review and tagged BosGuy, Boston Guy, Restaurant Review. Bookmark the permalink.